I run back the cabin-top and look about us. It is obvious that American hospitality is about to take charge. I do not feel in the least tired, but slightly vague about everything that surrounds us. People gather round the machine and there is a huge crowd along the tarmac. I find myself being shaken by the hand and leis are hung about my neck; then I see John and Mrs Stannage at the side of the machine from which we have not yet thought about moving. It is good to see them, and they are full of beans about the flight. "You can't wear that terrible cap here," John calls to me, and I realize that my ancient flying cap is still on my head. It is an heirloom I have had since 1916 and it is always liable to be the subject of criticism from John. He threatened to destroy it before we left if I did not wear a new one. But I like the old one best. It looks awful but it gives me a comfortable feeling to have it on my head. As soon as it is possible for us to take stock of the surroundings we are introduced to Major-General Halstead Dorey, officer commanding the Hawaiian Station and Major Wright of the Army Air Corps who welcome us to Hawaii. 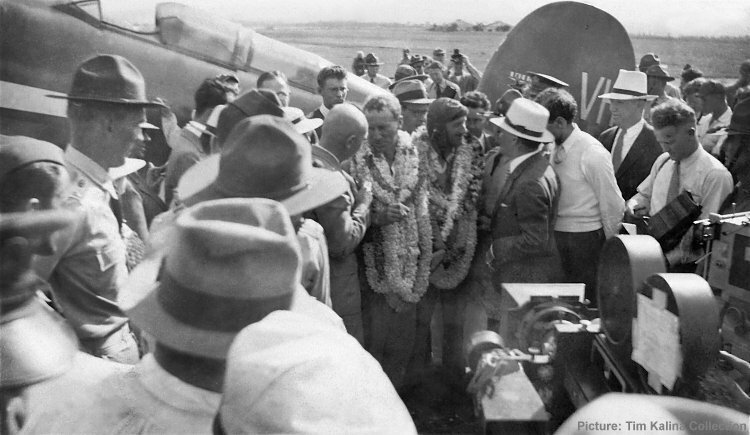 Then we are greeted by the representatives of the Honolulu Chamber of Commerce, Mr S. B. Maddams and Mr Alfred Alexander who take charge of our somewhat bewildered wits; bewildered not with the flight, but with the magnitude of our reception.